Medical Assistants play an important role in our medical system. Professionals in this field perform both Administrative and Clinical tasks to keep a medical office running smoothly. Medical Assistants interact with a wide variety of people in a pleasant office environment and they have the satisfaction of knowing their job helps others to live well. Administrative Training: The Medical Administration portion of the training involves Computer Applications, Coding & Billing, Office Procedures, the role of the Clinical Medical Assistant, and more. Hands-On Instruction: Our Lab portion of this program provides hands-on lab and lecture training in the procedures and skills necessary to assist physicians. The best way to see if NTI is the right fit for you is to see it for yourself. You can tour our facilities, and meet with both students and instructors. Book a Tour Now or Get more info. Professionals in this field work in physicians’ offices, outpatient care centers, hospitals, chiropractors, nursing homes, and more. What is your current hourly wage? This calculator is for simulation purposes only and should not be relied upon solely to make financial decisions. It is a tool that is offered based on information you provide about your goals and personal situation. All outcomes are based on employment data from various sources including the Department of Education and the Bureau of Labor Statistics. We offer no guarantee of employment nor should you rely on the accuracy of the information resulting from the use of the Calculator. The calculations are not provided on behalf of any school. It is a free service provided by Enrollment Resources to assist those evaluating the need to further their education. The calculations provided should not be construed as financial, legal or tax advice. All outcomes are hypothetical and past performance does not guarantee nor indicate future results. Healthcare is a “hands on” profession and there is no better way to learn it than by actually performing it. That’s why as a student in the NTI Clinical Medical Assistant program, you may qualify to take part in a professional externship experience. An externship is a great way to gain real world job experience and get a feel for your new career after you complete the program and meet the school’s graduation criteria. As a graduate of this program, you’ll be prepared to take the exam to achieve National Certification. National Certification is recognized throughout the industry and lets employers know how capable you are. Is a Career in Medical Assisting Right for You? Find Out! 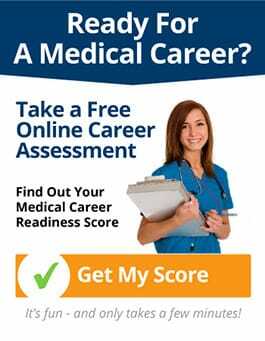 Take the "NTI Medical Assistant Career Readiness Quiz"
Click here for more information about our program outcomes, including occupational profiles, time to completion, program costs, and placement percentages. For more information on this career and to explore whether training as a professional Clinical Medical Assistant at Northeast Technical Institute is right for you, fill out the form on the side of this page to receive free career and program information right away. Get the answers you need…Fill out this form for your FREE Career Starter Guide complete with career analysis, videos, school catalog and more! To speak to a friendly and knowledgeable NTI Career Advisor, call us at 1-800-447-1151. Ask about coming in for a free tour of the campus nearest you. See for yourself what career training from NTI is all about, and how this could be the change you’ve been looking for. Clinical Medical Assistant Training and School in ME. Financial Aid, GI Bill®, and Grants for those who qualify. Find out more. NTI has partnerships with hundreds of organizations throughout Maine. Post 9/11 GI Bill® will pay eligible individuals tuition, housing allowance and more. Apply online or at your campus today for the Charlie Liponis Scholarship. Online job board for NTI students, alumni and Maine organizations. NTI is Nationally Accredited by the Council on Occupational Education.